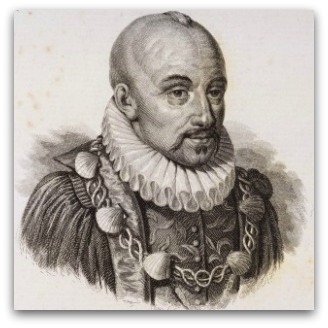 Both Michel de Montaigne (pictured) and Ignacio de Loyola had privileged upbringings. Both were born to wealthy Catholic families in Renaissance-era Europe. Both had a fine education, but Loyola's wasn't quite as extravagant as Montaigne's. In Montaigne's infancy, his father ensured that his tutor, his parents, and his servants all spoke to him exclusively in Latin. The idea was that Montaigne would learn Latin as his first language, as his father believed 'the tedious time we [apply] to the learning of the tongues of them who had them for nothing, [is] the sole cause we [cannot] arrive to the grandeur of soul and perfection of knowledge of the ancient Greeks and Romans'. Each day, Montaigne's father also ensured Montaigne was woken 'by the sound of some musical instrument'. At six years of age, Montaigne was sent to an elite French college, where he completed the entire curriculum by age 13. Montaigne then went on to study law. Both Loyola and Montaigne proceeded to lead illustrious early careers. Montaigne became a public figure, acting as counsellor and courtier to various important men. Loyola became a distinguished soldier, a career he later admitted appealed mainly because of its glamour and excitement. Montaigne felt his critics were too demanding: 'They are unjust to exact from me what I do not owe, far more rigorously than they require from others that which they do owe,' he complained. Montaigne did not feel he owed anyone anything. As long as he did not actively take, who would have the temerity to ask him to give? He adopted as his mantra: 'What have I done for Christ? What am I doing for Christ? What will I do for Christ?' Loyola felt life was about a calling, a mission from God to live our lives in his service. Several centuries after Loyola and Montaigne's lives, I was born. Like them, I was privileged to receive a rigorous education — 13 years of private education, followed by five years of university studying arts and law. When this year ends, I will have finished university and will be forced to begin forging my life's path. Will it be sufficient that, like Montaigne, I have a happy disposition, find a job I enjoy, and do no harm? Or ought I to follow Loyola's philosophy, and regard 'happiness' as simply a distraction from the real goal of life — 'to serve'? In his book, The Pleasures and Sorrows of Work, Alain de Botton expresses scepticism at the notion of a 'calling' that so influenced Loyola. He believes 'calling' is an 'unfortunate' term, prone to torturing us with false hopes of fulfilment and meaning. Botton seems more sympathetic to the views of a career counsellor he observes, who believes one's career is 'an act of selfhood'. A good career, according to him, is one that makes you happy, one where you do what you love. When one of the counsellor's clients says she likes helping people, the counsellor adds 'altruism' to a list of the client's interests. To the counsellor, altruism is just another interest, another clue to what career this client might find most rewarding. It shares equal weight with the client's interest in a seafood restaurant. The Loyola approach of 'service' appeals for two reasons. First, Montaigne sees no contradiction in complaining that his fellow citizens demand from him 'what I do not owe'. His incredibly privileged youth has left him with no feeling of obligation towards his much less fortunate fellow humans. I was not given a Latin tutor at birth, and my father is yet to hire a musician to wake me up. But when I consider all I have been given, all the sacrifices that have been made for my sake, and all the work nearly two decades of education has involved, I cannot help but feel that if the objective of all that was simply my contentedness, the means were disproportionate to the end. The Loyola approach speaks to this sense of obligation, what some disparagingly label 'middle class guilt'. Second, despite his Christianity, the Montaigne approach makes little allowance for any Christian desire to live out Gospel values. To Christians such as myself, this also makes Loyola's approach to one's career appealing. A personal passion for 'making a difference' — seeing things change for the better, ideas becoming reality — also motivates my preference for Loyola's call to unselfish service. Botton's career counsellor might at this point claim no contradiction exists between the two approaches. If I am passionate about 'service', I should follow that passion, and have a rewarding, happy career. However, 'service' almost inevitably means less money and less respect. It would be untruthfully high-minded to claim complete indifference to such considerations. Further, areas of interest often don't correlate with areas of need. I find constitutional law fascinating, but see little scope for a steady career in that area that could honestly be characterised as altruistic. Proponents of the 'Montaigne approach' argue there is a false dichotomy between commercial jobs, where the object is financial gain, and altruistic jobs. This argument adopts the capitalist philosophy that acting in one's self-interest is the best means of furthering the common good. Self-interested actions lead to economic growth, and economic growth will eventually solve all the world's problems. In this way, everyone from investment bankers to road workers all work towards the common good. It is certainly wrong to characterise any commercial job as somehow evil. Yet simply becoming a 'cog' in the 'capitalist machine' seems an incremental way to achieve any real good. Further, the 'capitalist machine' might not be perfectly designed to achieve good for each member of society equally. Though the Loyola approach holds considerable appeal, in many ways the Montaigne approach is more sensible, and probably more conducive to happiness. Perhaps it is foolish to attempt to practice altruism in an employment context. Employment is about remuneration for labour, not changing the world. If one wishes to practice altruism, perhaps that is best pursued through volunteering. In this way, a happy, but also ethical life can be attained, by working in a field you enjoy, and then volunteering in one's spare time. An obvious issue with both approaches is that not everyone can pursue an altruistic career, nor a fulfilling one. Many must simply find whatever employment is available to earn a living. Some therefore perceive an arrogance in agonising over this dilemma. It's certainly a preferable position to be in. But there is nothing arrogant about recognising that your privileged position might alter your motives in seeking employment. I am inclined to conclude that though the 'Montaigne approach' is sensible and easy, life is not about being sensible and taking the easiest route, and so I will always pursue a path of service. I fear, however, that this is a view too easily expressed on paper. The truth is that, as I conclude my studies, I have only a handful of clear ideas as to how my life ought to proceed. Perhaps the best approach is not to determine my life's course at this moment. In the end, words and the writings of Renaissance-era thinkers can take us only so far. Perhaps all I can do is throw myself into the world, and hope that by doing so I will discern my place within it. Patrick McCabe studies Law and is a contributor to the Adelaide University magazine On Dit. With this essay he won Eureka Street's 2011 Margaret Dooley Award for Young Writers. "Perhaps all I can do is throw myself into the world, and hope that by doing so I will discern my place within it." Nicely written, sir, and if I may say so, the only plan which is truly available to us. I dare say that Montaigne would approve, he being fonder of action than of fancy words. "And the title Great we now attach to kings who have nothing beyond routine greatness." "When judging another's life, I always look to see how its end was bourne"
A Worthy Winner of the Margaret Dooley Award! Please promise me, Patrick, that in five years time you will write another essay on the existential experience of throwing yourself into the world. By that time I hope you will be living a happy, healthy and productive life wherever you are. If your essay is anything to go by - the world's your oyster. You ask whether your privileged life requires service as a kind of repayment. The best thing you could do for the world is to dedicate yourself to ensuring that every kid gets the education you got - or no one does. It is the inequality that leads to the question - do I deserve what other people don't have? Maybe constitutional law is really important in setting up a just society, and perhaps helping emerging countries find a balance for the wellbeing of their citizens. I feel it is often structural things that cause many problems. A wonderful piece. Mustn't have been hard for the judges of the Margaret Dooley award. Your throwing yourself into the world, Patrick, promises well for us all, and suggests that you will find plenty of scope for, and success in, service in public affairs. A great essay. Some lucky people find, even if only for a short time, employment which achieves both of these, and even sometimes, good pay as well. Did Samuel Johnson contribute more to humanity when he was working hard, or when he was idly blathering? I myself is doing my final semester studying robotics & mechatronics engineering. I can say that I find our lives quite similar! I asked myself the same questions during these years especially now that I will enter the workplace. Thank you very much for this article!! "Perhaps all I can do is throw myself into the world, and hope that by doing so I will discern my place within it." I think so too but I personally think God will play a big role to guide me during the progress. Good read Patrick.Great questions to explore. I am still wrestling with them at over 50. I certainly have volunteering to be worthwhile... as long as it is about serving the needs of the other not your personal need to be useful! God bless you as you explore and live!... and not settle for "easy" answers. God is richer than that... and so is the life He gives us. Thanks for your generous sharing. I found this article the morning after watching the documentary 'Finding Joe' (Joseph Campbell). He talks about finding one's Bliss ... and commentators in the doco refer to this as 'what makes us break free to follow our own journey'. The big difference between the two men quoted by Patrick is that Ignatius faced his crisis and Mantaigne would appear to have found his comfort. The lesson for all of us is, in 'throwing oneself into the world' is to be able to face one's drowning, crisis ... leading to initiation ... so that the real adventure can begin as it did with Ignatius and out of this challenge we become open to what he talks about as 'our desire' ... or in Campbell's terms ... our bliss. The quality of this article is only rivalled by the comments that it inspires! I'm grateful to have stumbled upon it - in finding ways to inspire my students with "real" assessment tasks. This essay presents an interesting conundrum for those that are privileged to have it. I'm lucky to have discovered the "bliss" that it is to be able to make a difference to others... the ways and opportunities seem limitless. Time dreaming up new ways is valuable also... That's why teachers have to have such long holidays!